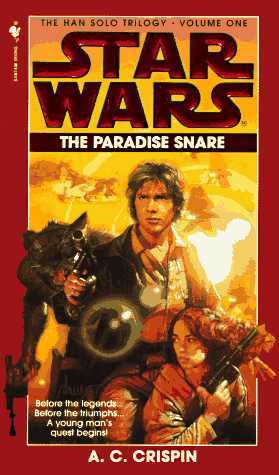 This final book of the trilogy packs in all of Han Solo’s life from the minute he joins the huge gambling tournament in Cloud City up until the moment he meets Luke Skywalker in Episode IV: A New Hope. 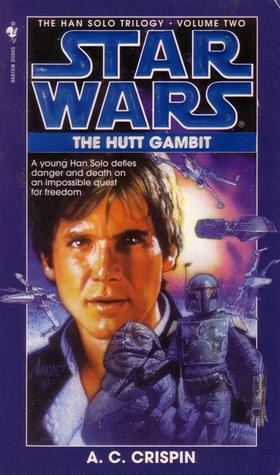 Han Solo does not believe he is an especially good gambler, but he takes a chance and uses all of his money to play in a giant sabacc tournament. His friend Lando Calrissian is there, and much to Han’s surprise they are the last two in the game when Lando throws his ship, the Millenium Falcon, in to the pot- not a smart move for Lando. After winning a ton of credits and the ship of his dreams, Han is off to the Corporate Sector to spend his fortune and build up his ship. Meanwhile in the galaxy, Han’s old girlfriend Bria is a leader in the Rebel Alliance and is working hard to unite worlds against the evil Emperor. The Hutt’s are also facing a lot of turmoil as one Hutt clan is pitted against another in endless devious schemes, most resulting in grizzly murder. When Bria approaches Han to rally his smuggler friends and help her lead a Rebel attack against the slave world Ylesia that once owned her, the promise of a fortune is something he can’t resist. One really fun thing about this book, for all of the Star Wars fans out there, is that the very last line nicely sets up the scene where we first meet Han in the movies. A great, thrilling ride, this is definitely worth picking up if you like science fiction of any kind. 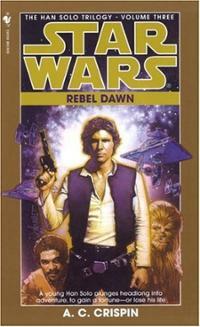 To continue with the Han Solo Trilogy, this week we bring you book #2! If you thought the first book was exciting, brace yourselves for this action-packed title. Last we saw Han, he was preparing to entire the Imperial Academy. When this book begins, it’s five years later and Han has just been ejected from his post as an officer in the Imperial Navy for standing up for a Wookiee slave named Chewbacca. Chewie swears a “life debt” to Han, beginning the long friendship that everyone know from the Star Wars movies. The two of them start a successful life on Nar Shadaa, the Smuggler’s Moon which is overseen by Hutt crime lords, and go on quite a few adventures. Everything seems to be going as well as it can go for two smugglers until they discover that the Empire has targeted their new home world for total destruction. The residents of Nar Shadaa are devastated, but they are a tough group- they band together to thwart the Empire’s attack! Meanwhile, Han’s old love Bria is working very hard to begin with rebellion that Star Wars fans know will eventually bring down the evil Emperor Palpatine and his minion Darth Vader. Fans of Star Wars should definitely try and read this whole trilogy, but those of you who are only interested in Han’s life after his attempt at the Imperial Navy should not have a problem starting the story with this book.